Our frittata was made in an extra-large, cast iron, skillet which created a thinner version. The end of summer is normally a solemn time in the Verano household. What’s left of the garden is competing with weeds that, if edible, would provide a cash crop on which my wife and I could retire. The anticipation of the fall harvest lends some comfort, however, it still feels like melon and berry season in our hearts. As sandals give way to sneakers, and short to jeans, light and brightly colored meals will give way to the heavier and heartier stews, roasts, and gravies of winter. Fortunately, our membership with Off the Vine allows us to linger a little longer in summer’s glow. Our ode to the summer of ’12 was a celebration of colours and textures; a mélange of peppers, onions, potatoes, eggs, cheese, and tomatoes. This frittata masterpiece, this egg-ceptional interplay of proteins and carbohydrates, is something you have to try. The frittata, Italian for “What are we going to do with all of these eggs,” is sometimes considered an open-faced omelet. Unless, of course, one is Italian and therefore knows that an omelet is the wimpy cousin of the firmer and, let’s face it, better tasting frittata. Easy to make, it’s good for breakfast, lunch, or dinner. This dish has become a go-to in the Verano household for a quick and wholesome meal. I would even go so far as to call it our version of an egg pizza, if that didn’t sound just a little gross. Like pizza, however, anything goes, so add whatever in your share sparks your interest. 1. If you’re adding potatoes, make sure you’ve cooked them through before adding the egg mix. There’s nothing worse than biting into fluffy eggs only to have your teeth grind to a halt after hitting a partially cooked spud. 2. Most recipes start on the stovetop and end up in the oven. Be careful how long you leave the mixture on top of the stove. Unlike the omelet, you do not move, shake, lift, or flip this version of a frittata. This can result in the bottom taking on the quality of burnt toast; at which point you may as well check the egg carton to see if you have enough to start over. 3. Realize that whatever you add to the pan, the egg mixture is going to have to lift if you want a frittata that rises rather than surrenders to gravity. Unless you’re using extra-large, grade AAA, Arnold SchwarzenEggers, be judicious with the add-ons. 4. Be willing to eggsperiment (sorry, but the eggs puns are too hard to resist, so the yolks on you) and put some condiments on the side for the daring. Tabasco sauce is a personal favorite, however, you can try splashing on whatever suits your fancy. 5. Finally, appreciate that any egg-based dish is only going to be as good as the eggs themselves. That’s great news for the Off the Vine crowd, as nothing tastes better than organic eggs that come from stress-free chickens. 2 tablespoons chopped fresh basil, parsley, and rosemary. 10-inch heavy ovenproof skillet, preferably nonstick or cast-iron. Whisk together eggs, cheese, salt and pepper to taste, and herbs in a large bowl. Heat skillet over medium heat and add 1 tablespoon oil. Add potatoes and 1/4 teaspoon each of salt and pepper to skillet, and sauté over medium-high heat until golden, about 3 minutes. Cover skillet and continue to cook over medium-low heat, stirring a few times, until potatoes are just tender, about 3 minutes more. Add 1 tablespoon oil to a separate skillet and sauté onion until almost caramelized or to taste. Add garlic and peppers to pan and cook until just tender. Add onion mixture to skillet with potatoes, spreading evenly. Pour egg mixture evenly over vegetables, and cook over medium-high heat, until just set, with a moist top and center. Add diced tomato and place pan under broiler, 5 to 7 inches from heat, until set and lightly browned. Remove from oven. 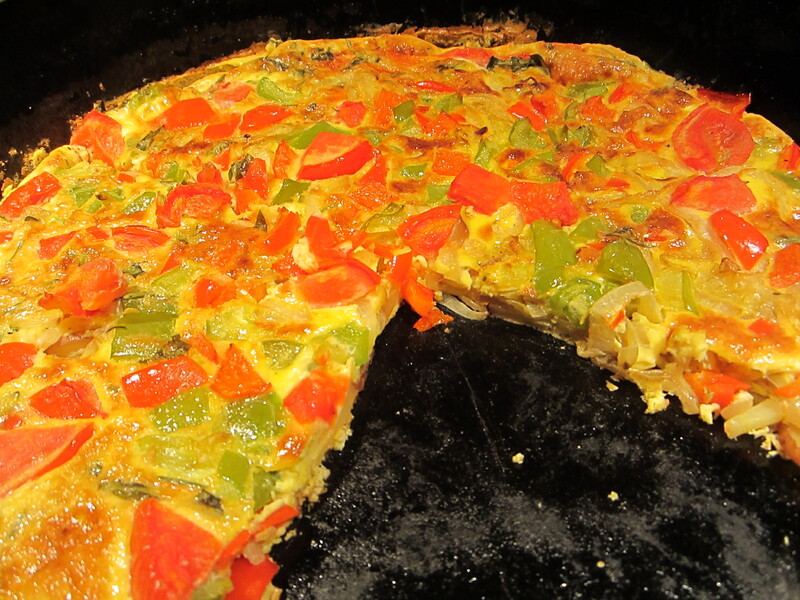 If using a nonstick skillet, slide the frittata onto a serving plate. If using a cast-iron skillet, cut and serve wedges directly from the skillet.